Corner of Oxford Rd and Emory Rd. 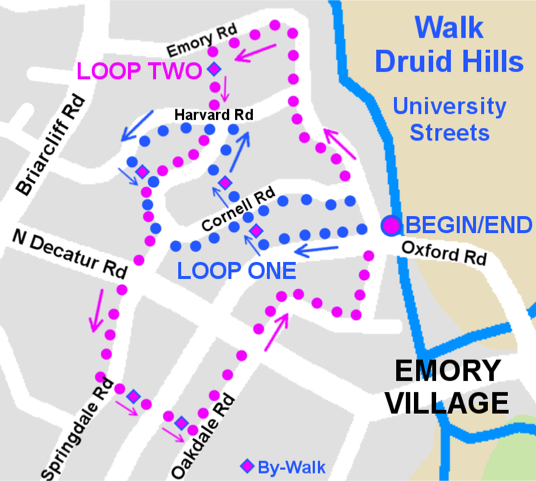 Please join us as we stroll the University Streets neighborhood of Druid Hills on Saturday, July 14th at 9:00 AM. We will explore several of the "by-walks" and hear about many of the historic homes throughout the neighborhood. We will meet at the corner of Oxford Rd and Emory Rd, just north of the big roundabout in Emory Village. Park along Emory Road, north of the intersection. The walk totals just under 3 miles and includes some stairs and uneven sidewalks. Walk Druid Hills meets the second Saturday of each month to explore the community and meet our neighbors. Bring a water bottle and bring a friend. Check www.druidhills.org for upcoming walks.